Play for about $7.25 per person per game (including ref fees and uniforms) with a team of 12. 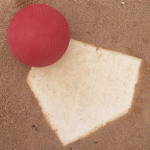 Check out this Kickball league 'Kickball 2019 Spring Monday Houghton Park' with Game On! Sports!